CHICAGO (CNS) — Leaders in Catholic-Muslim dialogue called on members of both faith communities to find ways to accompany one another and work together at a moment when all religion is under threat from an increasingly secular and even anti-religious society. San Diego Bishop Robert W. McElroy, co-chair of the U.S. Conference of Catholic Bishops’ West Coast Catholic-Muslim Dialogue, and Sherman Jackson, a professor of religion and American studies and ethnicity at the University of Southern California Dornsife, both offered comments at a March 8 public session in Chicago. 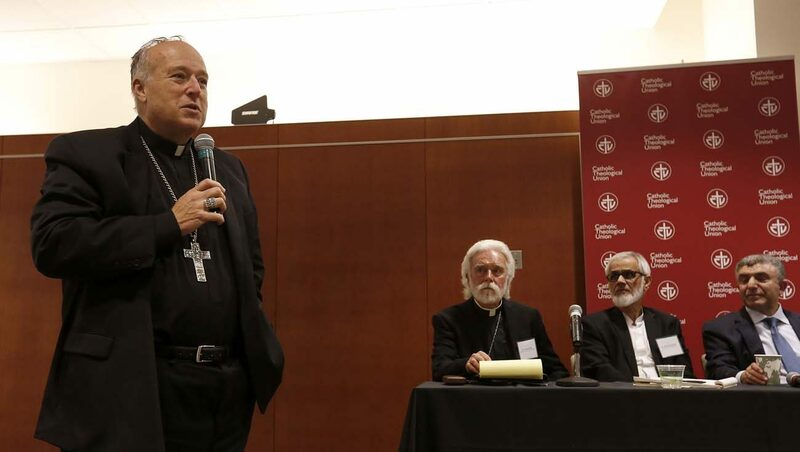 The public session came during the March 7-8 National Catholic-Muslim Dialogue, co-sponsored by the Committee on Ecumenical and Interreligious Affairs of the U.S. Conference of Catholic Bishops and held at the Catholic Theological Union. Bishop McElroy said that theological dialogue and reflection is important, but the relationship between Catholics and Muslims in the United States must extend beyond theologians and take on a pastoral aspect. “It is not enough to clarify our commonalities and differences on a deep theological level or even to publish these findings, if we do not take steps to broadly convey this deepened level of friendship and truth to Muslims and Catholics within our nation,” he said. At the moment, Catholic and Muslim communities simply do not know one another well enough, the bishop said. The U.S. bishops’ ecumenical and interreligious committee has co-sponsored three regional Catholic-Muslim dialogues for over two decades — mid-Atlantic, Midwest and West Coast. In February 2016, the committee announced the launch of a national dialogue. Chicago Cardinal Blase J. Cupich began his tenure as the Catholic co-chair of the national dialogue Jan. 1. The Muslim co-chair is Sayyid Syeed, director of the Islamic Society of North America’s Office of Interfaith and Community Alliances. “It is the ignorance of not knowing one another as brother and sister precisely in our religious identities,” he said. Jackson said the obstacle to greater friendship and cooperation goes beyond ignorance to fear. Catholics faced similar suspicions in the United States of the 19th and early 20th centuries because they were believed to have a higher allegiance to Rome than to the country. “The Jewish Question,” the phrase coined by German philosopher Bruno Bauer in the 19th century, was based on the idea that Judaism was a religion of laws that governed private and public conduct, and as such, was incompatible with the modern secular state, Jackson said. Religion — whether Christianity or Islam — can be seen as opposed to the European enlightenment liberalism that American founding fathers relied on. Religious traditions, including Islam and Christianity, set a much higher value on the common good, Jackson said, and call on their members to contribute to it. Muslims who embrace Shariah — Islam’s religious law — can contribute to and benefit from the common good in any number of ways, from following speed limits to keeping public spaces safe for all. The challenges of the current moment — including climate change, corporate greed, mistrust between law enforcement and communities of color, among others — could offer an opportunity, he said. “In fact, given these contemporary challenges, now might be the time when religion in America, including Islam, is best positioned to demonstrate its value as a contributor to the common good,” Jackson said. Bishop McElroy called on Catholics to take a more vocal stand against anti-Muslim discrimination in the United States and elsewhere. “If the Catholic-Muslim dialogue is to mean anything at this current moment in our nation’s history, the Catholic community must in the context of this dialogue condemn unequivocally the anti-Muslim prejudice which is present in our midst, and more sadly, present within our own Catholic community,’ he said. Bishop McElroy also called on Muslims to condemn the persecution of Christians in Muslim-majority countries, which, he acknowledged, many have already done. “I have spoken at length with many Muslim leaders within the United States who have pressed for authentic religious toleration throughout the Middle East, and I know many who have placed their own lives and reputations at risk in this effort,” he said. “But it is a work of the entire Muslim community within our nation, for building a society founded upon the principle of inclusion and religious liberty is a labor which will never be fully accomplished and will always have enemies,” Bishop McElroy added. Martin is a staff writer at the Chicago Catholic, newspaper of the Archdiocese of Chicago.